Summer Classics deals in manufacturing superior quality, long lasting yet attractive patio and outdoor furniture of various materials like, iron, cast aluminum, resin wicker and even teak. Their products range over a wide spectrum including motion seating, lounge chairs, sofa sets, umbrellas and their bases, tables, benches, chaise lounges etc. The company is into this business from more than twenty-five years, since 1978. They are the first in the world to introduce organic wicker material furniture that stood against any adverse weather condition, making break-through progress in patio furniture material. They introduced an indoor furnishing section under 'Gabby' in 2010. There are currently 0 consumer reviews about Summer Classics available. Share your review. Please take a note that you are about to post a public review about Summer Classics corporate office on CorporateOffice.com. This review will be public, so please do not post any of your personal information on this website. 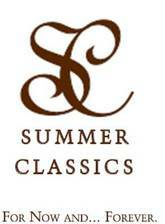 If you would like to contact the corporate offices of Summer Classics, please use their contact information such as their phone number, website, and address listed above to contact them. However, sometimes staff from Summer Classics headquarters do read the reviews on this website.